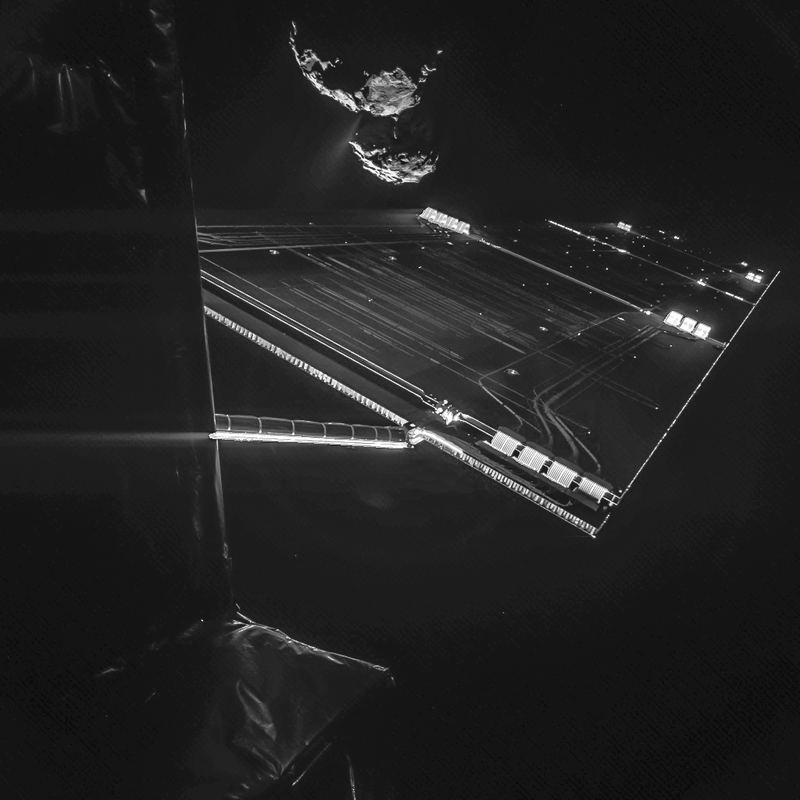 Explanation: This Rosetta spacecraft selfie was snapped on October 7th. At the time the spacecraft was about 472 million kilometres from planet Earth, but only 16 kilometres from the surface of comet 67P/Churyumov-Gerasimenko. Looming beyond the spacecraft near the top of the frame, dust and gas stream away from the comet's curious double-lobed nucleus and bright sunlight glints off one of Rosetta's 14 metre long solar arrays. In fact, two exposures, one short and one long, were combined to record the dramatic high contrast scene using the CIVA camera system on Rosetta's still-attached Philae lander. Its chosen primary landing site is visible on the smaller lobe of the nucleus. This is the last image anticipated from Philae's cameras before the lander separates from Rosetta on November 12. Shortly after separation Philae will take another image looking back toward the orbiter, and begin its descent to the nucleus of the comet.